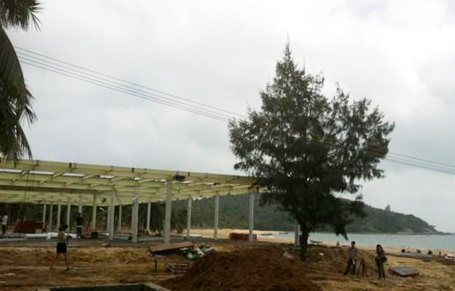 According to the Wanning Municipal Government, the largest surfing club in China has been confirmed to settle in Riyuewan and construction work is now going underway smoothly. Covering a total area of 1,600 square meters, the surfing club will be the largest surf club in China and the second largest in the world. The action to base a surfing club in Wanning’s Riyuewan comes after the success of the 2010 International Surfing Festival. The three day event attracted surfing professionals from all over the world including Australia, New Zealand, Canada, Germany, America and Japan to gather there. We are trying to provide a comprehensive series of supporting facilities to build a reputation for surfing in Hainan, and also hope the annual festival will give another boost to the island’s tourism, Wu Mingyang, the Vice Mayor of the Wanning Government said. Located 87 km away from Sanya City center, Riyuewan, has drawn international attention for its ideal surf conditions, where the best time for surfing usually falls from October to April. Besides, the local government is planning to build other related projects including a surfing-themed park and a surfing training base to make Wanning a real paradise for surfing fans.